The traditional landraces, weedy and wild relatives of crop plants, which constitute a significant pool of the available genetic diversity are continuously being lost or threatened with loss due to a number of factors. One of the most important causes of this loss is the introduction of improved varieties. While this is desirable for increased crop productivity, it tends to narrow the genetic base making crops more vulnerable to disease epidemics and other vulgaries of nature. It is this realisation that has led Government to put in place deliberate measures aimed at the conservation and sustainable utilisation of the locally available crop germplasm. The National Plant Genetic Resources Programme is co-ordinated by the Ministry of Agriculture and Cooperatives (MACO) through the Department of Research and Specialist Services, Soils and Crops Research Branch. 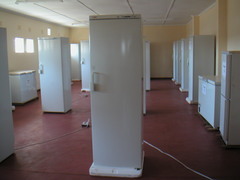 The National Plant Genetic Resources Centre (NPGRC) is located at Mount Makulu Research Centre (15 kilometres south of Lusaka) holds the National Genebank and shoulders the overall responsibility for the implementation of the relevant activities under the programme. The National Plant Genetic Resources Committee which is composed of representatives from relevant institutions involved in various aspects of crop/plant development and improvement work in the country provides policy guidelines in the implementation of the National plant Genetic Resources Programme and provides a mechanism for collaboration and networking among various stakeholders in the country. There are 1666 accessions collected from 1999 to 2003. Collection expeditions have been undertaken covering almost all parts of the country and involving all the major traditional crops, some of the minor crops and wild relatives. Crops that have been collected include Cereals, Food legumes, major root and tuber crops and indigenous/local vegetable species have also been collected. The collection has however not been done for all areas and crops and other plants relevant for food and agriculture. Future collection missions will therefore be targeted at filling these collection gaps. There are 370 accessions characterised morphologically. Characterisation serves to provide descriptive information on the highly heritable traits of an accession. Accessions are characterised using morphological data obtained from growing pla nts. About 20% of the accessions held in the Genebank have so far been characterised using morphological data. Use of molecular techniques such as RAPD may be employed in the future. 1145 accessions have multiplied or regenerated. This is done when the seed quantity (amount) is below the required amounts and when the seed viability has fallen below the required germination percentage i.e. 85% for most crops. This could be lower for some crop/plant species such as vegetables and grasses. These activities are done to increase seed quantity and renew seed quality in order to maintain genetic integrity of the conserved germplasm accessions. Plant genetic resources material kept in the genebank is accompanied by a large volume of data and information. This is generated through inventories, collections, multiplication, regeneration, management, characterisation and evaluation. Currently most of the data has been entered in the various databases using an information system developed at the SADC Plant Genetic Resources Centre called SDIS. Data and other information are also being kept manually. The total number of accessions held in form of seed samples in our National Genebank as at 30th August 2003 is 5,710 as accessions in active collection. 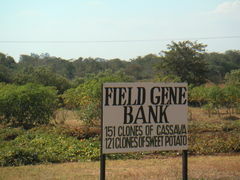 307 clones of root and tuber crops comprising 185 cassava, and 122 sweet potato are in th e field genebank. Currently there are 6012 accessions as seed samples and 185 clones of vegetatively propagated crops (cassava, sweet potato) maintained at the National Genebank Some of the samples were repatriated from organisations, commodity research teams e.t.c.